With some rather dynamic equity swings to start the week, the VIX remains close to the key 20 threshold, settling -7.3% @ 19.43 (intra high 22.81). Near term outlook offers renewed equity downside to the sp'1920/00 zone, which would likely equate to VIX in the low 30s. VIX is holding close to the 20s.. something that was a rarity across 2012-14. 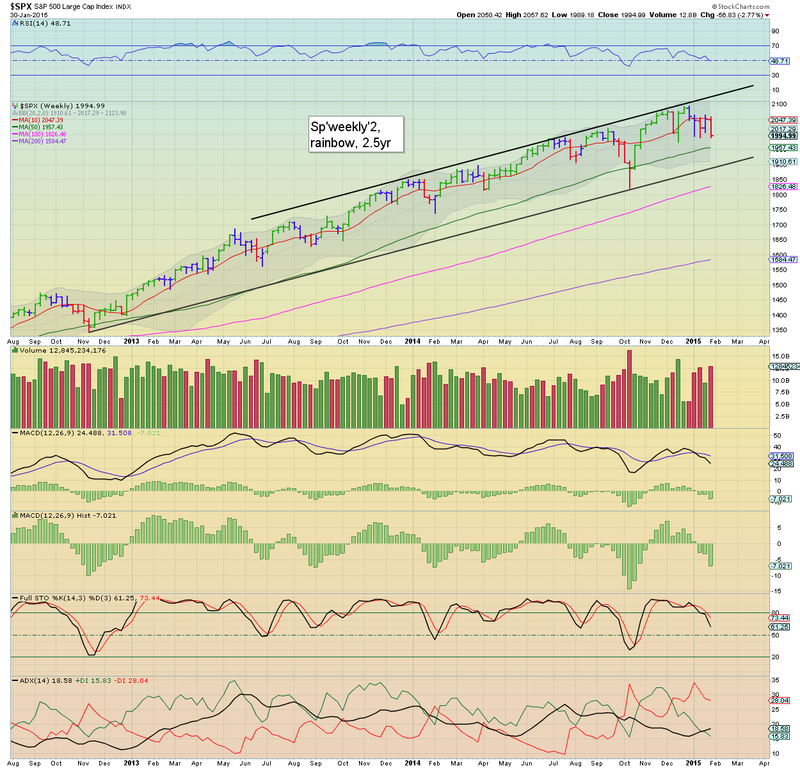 With a bearish monthly closing on the equity indexes, it would seem 'something new' is underway. 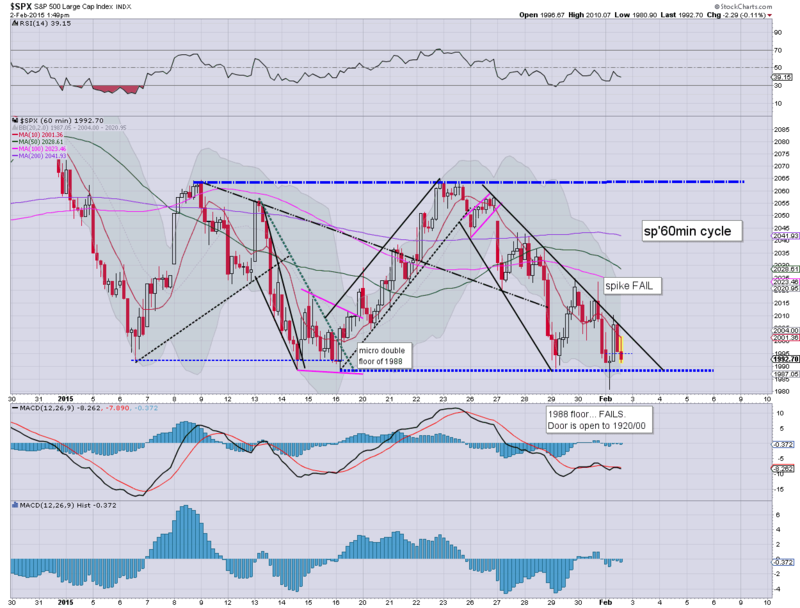 US equities saw some rather dynamic swings across the day, with the sp'500 settling +25pts @ 2020 (range 2021/1980). The two leaders - Trans/R2K, settled 1.5% and 0.9% respectively. 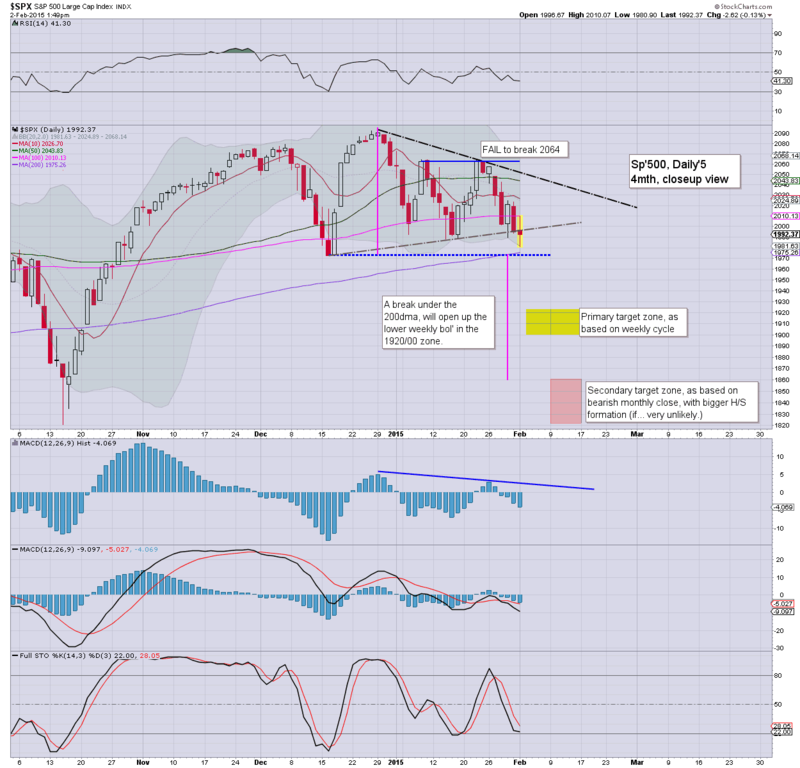 Near term outlook is increasingly bearish, with viable downside to sp'1920/00, along with VIX in the 30s. *pretty strong closing hour ramp.. as resistance is broken... and held. Suffice to add....an interesting start to the week.. as the market battles (if somewhat vainly) to hold together. Even if Tuesday sees further gains to around 2025.. there looks to be HIGH probability of renewed downside across the next 9 trading days. 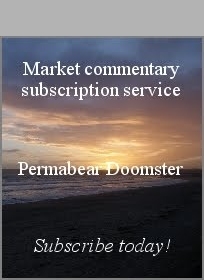 *I will be looking to pick up an index short position tomorrow morning (my first since late Oct). US equities look set for some chop into the Monday close... somewhere close to the giant threshold of sp'2000. VIX remains comfortably holding above the key 20 threshold, and there remains threat of VIX in the 30s... along with sp'1920/00. 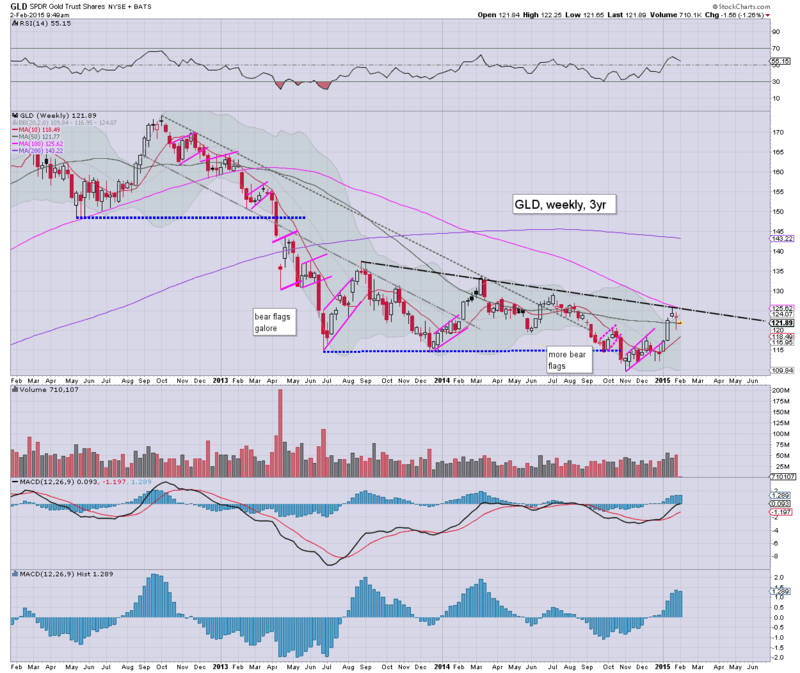 Metals remain weak, Gold -$5. *I realise some would argue against it, but even a brief Tues/Wed' rally to 2015/25 won't negate the damage done today. Interesting day... at least its not algo-bot melt! **I remain on the sidelines, will consider picking up an index short tomorow morning. 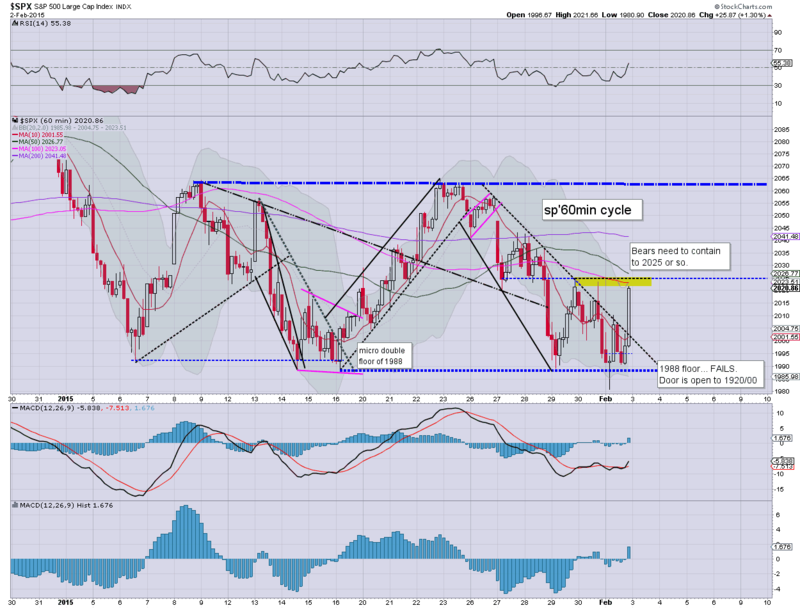 Considering the weekly/monthly cycles.. it now seems a viable trade. So... each micro rally is being sold into.. and with the FAIL of the 1988 double floor.. the door is wide open to the 1920/00 zone. I do NOT expect the 200dma @ 1975 to hold... price action sure doesn't support that. Notable weakness: FB -2.5%... struggling after last weeks earnings. 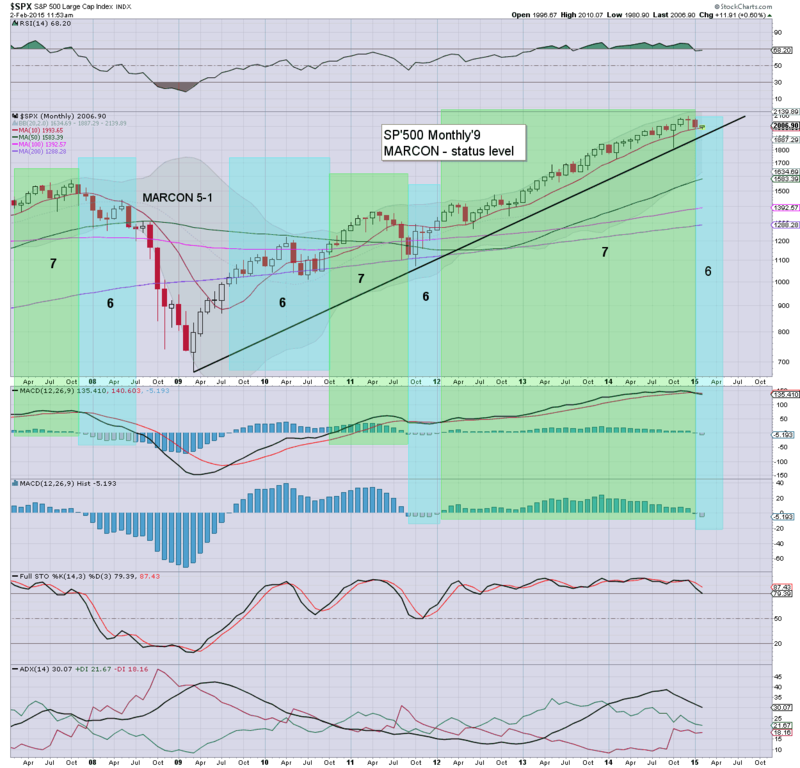 *note the MACD (blue bar histogram) cycle on the monthly chart... even with a bounce to sp'2008.... we're still building downside momentum. Yes... we are only day'1 of the trading month... but bears do have a real chance here to whack the market lower across the next few weeks. Best guess.. this is just a minor equity bounce... primary downside target zone remains 1920/00 within the next 9 trading days. If sp'1900... VIX will probably be in the low 30s..... VIX shorts... beware. **seemingly.. taking a day off. 1.04pm.. suffice to say... weak weak weak.... as noted earlier.. the damage HAS BEEN DONE. Bull maniacs in real trouble.... just awaiting a stinky headline about Greece.. for this to unravel into the 1960s. 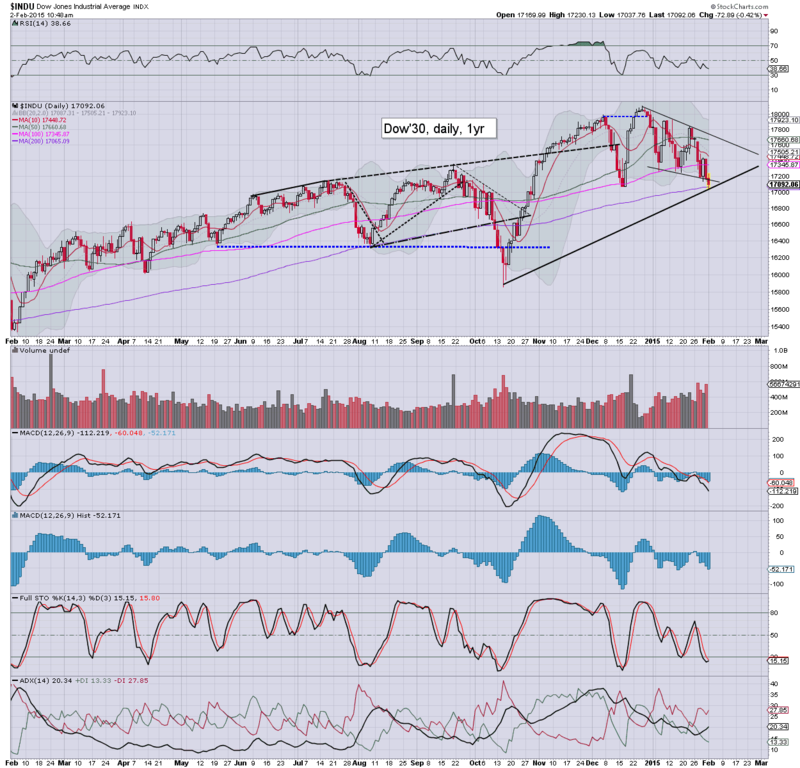 Whilst the sp'500 has broken the micro double floor of 1988... the mighty Dow has already lost the 200dma. Once the 17k threshold is lost, next support is around 16500, equv' to sp'1920/00 zone. Metals remain weak, Gold -$11. 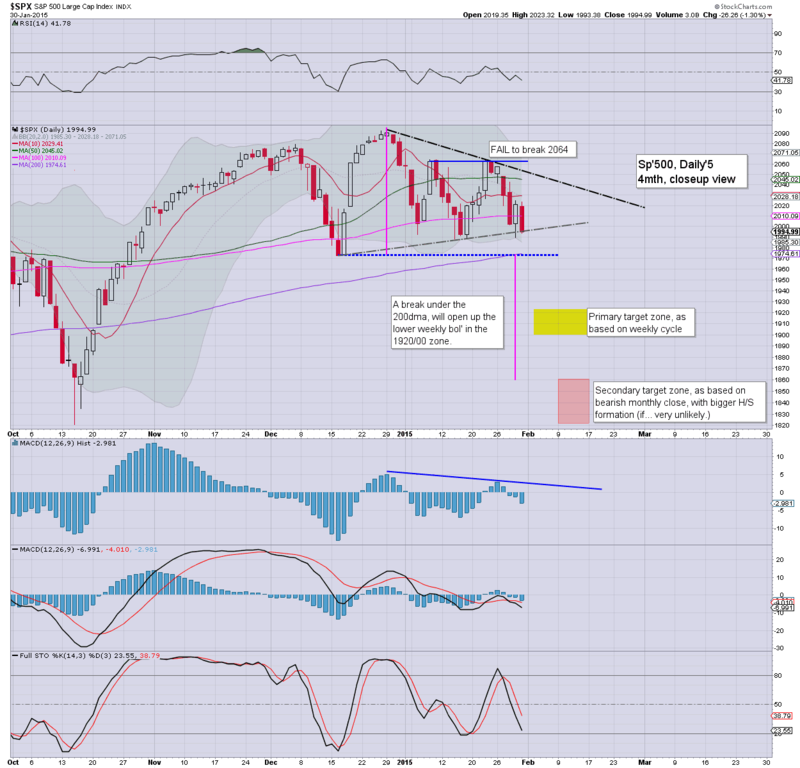 Weekly charts sure look ugly, now backed up by the monthly cycles... where downside momentum is BUILDING. Regardless of how we close... some further technical damage has been done today. 11.01am... typical turn time of 11am.. market trying to spike higher, but the damage has been done. More later.. on the bigger monthly cycles. 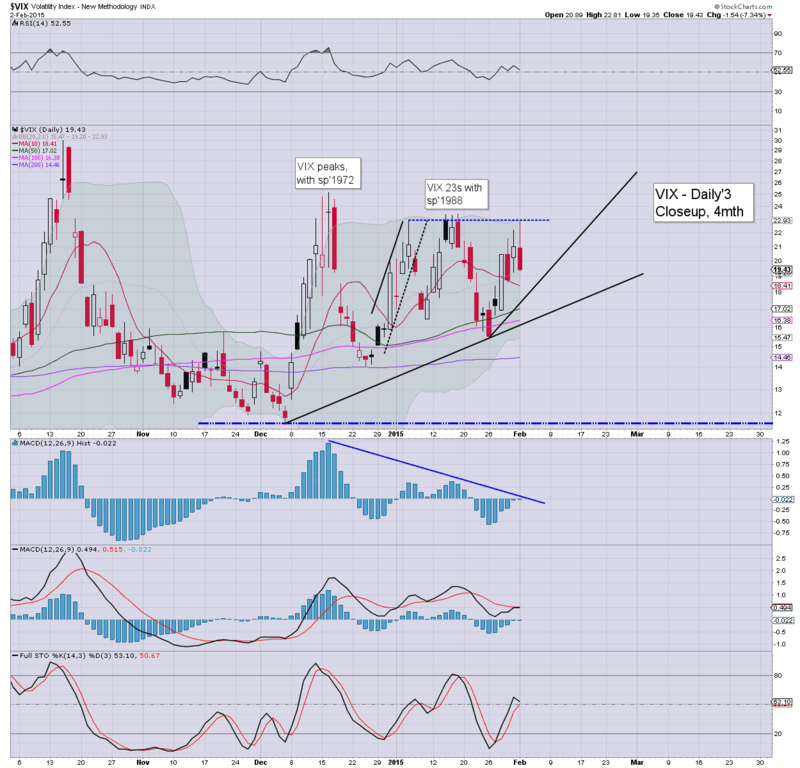 Despite the gains... VIX holding above the 20 threshold. *the weekly cycle for Gold looks like a very viable multi-week cycle (from early Nov') top... and we're now in the process of rolling lower. 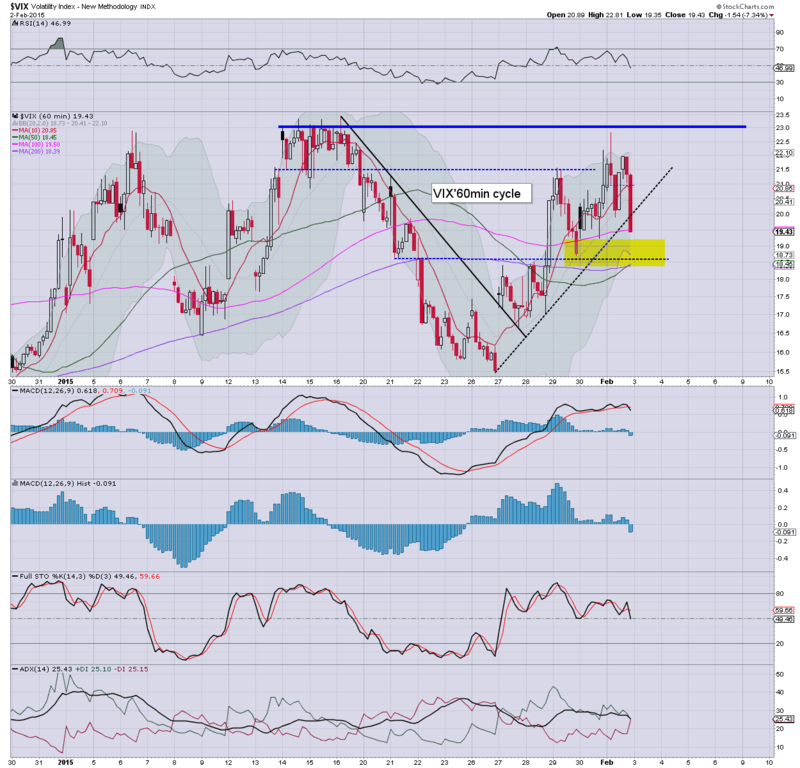 It remains surprising that Gold is not already close to $1000, considering Copper is in the $2.40/50s. So.. we're a little higher... but it sure doesn't look like bulls are going to be able to manage much today. Door is wide open to the low 1900s. Will be interesting to see how the chatter proceeds... when we lose the 200dma..
10.09am... sp'1980 already.... a very weak open for the market.... a mere 3% until first target zone. VIX confirming the move... +8% in the 22s. 10.37am.. Well, regardless of whatever happens in the rest of today... the break of 1988 is significant. Good morning. Futures are moderately higher, sp +6pts, we're set to open at 2000. Metals are starting a new month weak, Gold, -$9, with Silver -0.2%. Oil is battling to build upon the Friday gains, +3.5% in the $49s. Welcome to February! January was pretty crazy... with the SNB decoupling from the Euro fix, and the ECB announcing a QE-pomo program.... what 'wonders' are ahead for us this month? We're set to start the month with a little bounce... could last just a few hours.... or maybe into tomorrow. Recent price action is highly suggestive of a move down to the low sp'1900s within the next two trading weeks. 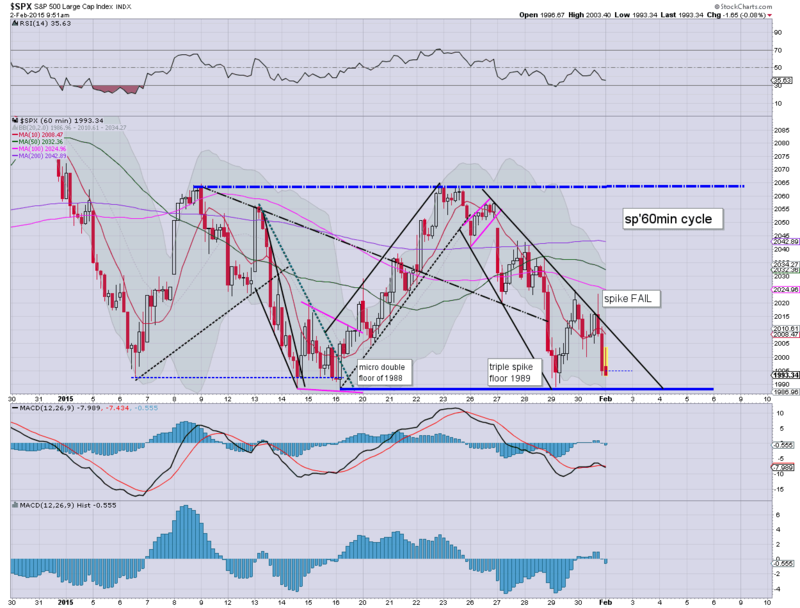 I'm even seeing talk of a move to the Oct' low in the 1850/00 zone. 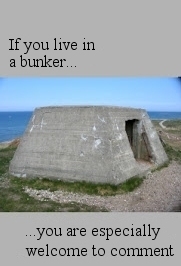 I suppose the latter is possible, but I'd only put a 20% probability on it. So... maybe we'll get a positive close today, but I don't think it will matter...the bears should be able to achieve a further....and more significant daily decline within the next 2 or 3 days...with a daily close under the 200dma in the 1970s. So... nuclear armed planes are being flown near my own capital... by bear bombers. Great... just great. What could possibly go wrong?